Globalisation, technological developments and a changing labour market are all challenges to organised work. Trade union leader Ragnhild Lied is at the frontline fighting labour market crime, the shadow economy, new organisational structures and the weakening of the working environment act. The tripartite cooperation is fundamental to the Nordic model. It means employers and employees negotiate about wages and working conditions, while policies and measures are often shaped through dialogue with the social partners. “The whole world can learn something from this,” believes Ragnhild Lied. She has felt the power of the trade union movement. 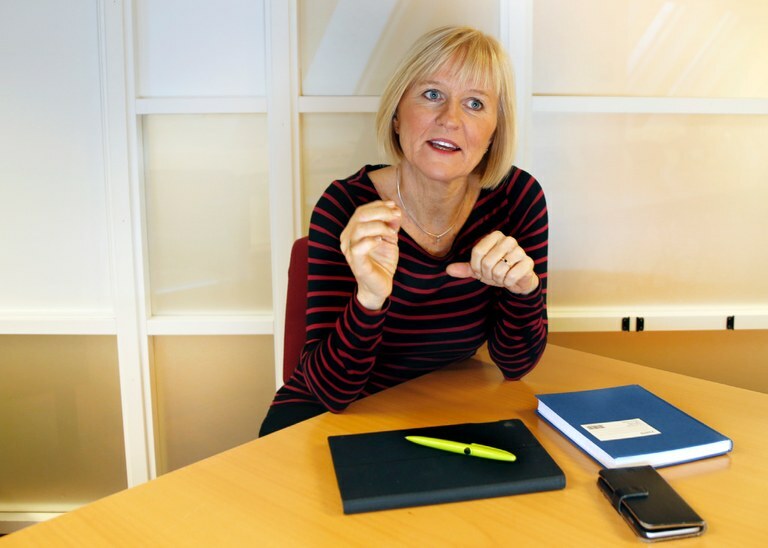 When she was the leader of the Union of Education Norway (Utdanningsforbundet), she experienced that members voted no to the negotiation position she had recommended. She believes this has made her more robust in the face of challenges. Today she is the leader of The Confederation of Unions for Professionals (Unio), the second largest trade union confederation after LO in Norway, and this year she also heads the Council of Nordic Trade Unions. A key issue will be to increase trade union membership numbers in order to strengthen cooperation between employers and the state. From her office, Ragnhild Lied has a perfect view of the Norwegian parliament. She often pops across the street to use her powers of persuasion in order to influence politics. Skills development is close to her heart. Unio represents 350,000 employees with higher education in the public and private sectors. Change and adaptation in working life as a result of globalisation and digitalisation creates uncertainty. Who is the employer and who is the employee in the future labour market? And what impact will robots and digitalisation have on working life? Skills development is high on everyone’s agenda. The government recently asked Ragnhild Lie to head a commission to assess the upper secondary education system. “I look forward to working towards making the upper secondary education even more targeted at the pupils’ needs and expectations. At the same time we will develop an education which better prepares people for active participation in society, for further education and for a changing labour market,” writes Ragnhild Lied on Unio’s website. Competence policies is a core issue. Not only for her and Unio; LO and all the trade union confederations have entered into a tripartite cooperation and have developed the ‘National competence policy strategy 2017 - 2021’. This will be followed up by a competence policy council, where the parties are represented. A lot is happening in this field, but so far the economic support is lacking. Poul Nielson, who presented the report ‘Working life in the Nordic region – challenges and proposals’ in 2016, proposed that Nordic countries should make adult and continuing education in working life mandatory. “He raises a very important issue,” thinks Ragnhild Lied, but the word mandatory makes the proposal difficult to execute. She comes from Volda in western Norway, her main language is Nynorsk and she commutes weekly to Oslo. She worked as an upper secondary school teacher and trained in sports sciences and outdoor life, she is the co-author of a PE textbook and feels the need to go home and climb a mountain every weekend. She feels at home among the fjords and the mountains. Summer and winter. She does a lot of skiing, down from high mountain tops plunging straight down into the fjord. She needs air and big vistas to free herself mentally and physically from life in the capital. She lives alone, nearly on the mountain, but does not go alone on longer walks. But now the labour market takes centre stage, along with the challenges which are mounting up. The platform economy is the unknown which Ragnhild Lied alludes to, but looser links to the labour market and loopholes allowing for social dumping are also major risks. The government has established five centres around the country in order to fight the shadow economy. This is where the police, the tax administration, the labour inspection authority and labour and welfare administration (NAV) work together to fight criminal activity in the labour market. “We are very happy about this. But it is not enough. You also need to look at the legislation and which changes are being made that could create loopholes for the shadow economy, so that you don’t end up giving with one hand and taking with the other. “How easy should it be to use staffing agencies? It is possible to make rules that clarify who has been awarded a tender. So there is plenty here to tighten up. When you have been given a commission, who is actually your employer? We need a transparent system which makes it easier to see and control information. “We need to be able to create a clearer framework for the kind of work that is to be carried out. When the cheapest tender is always accepted, who covers the reduced costs of the cheapest offer? She thinks the tender economy is an example of what is threatening to dissolve the organised labour market. Each step might not be a big one, but together they can become a serious threat. This also relates to the working environment act. “What is a pity, with the working environment act for instance, is that you make small changes that might look innocent, but when they are all put together they weaken the legislation and conditions for employees. “This is about regulations covering staffing agencies, the length of normal working hours, the increased opportunities to hire temporary labour. “The tripartite cooperation should also impact on the way policies are made,” insists Ragnhild Lied. “Look at Finland, where the tripartite cooperation is under threat and you do not find the same optimism which you see in a place like Iceland, for instance. What did Iceland do when the crisis hit? They invested in education, and they even finished building the big culture house, Harpa, in the centre of Reykjavik. When the going gets tough, it is important to build the community. The pay gap is a challenge which engages Ragnhild Lied. She represents many women in the public sector, and is keen that a solution must be found. Ragnhild Lied has been involved in trade union work on a European level, where there has been far more focus on migration than on wages and working conditions. She is equally concerned about young people who take a wrong turning in the education system. As leader for the commission tasked with looking at upper secondary education, she now has the chance to make her mark in this area. Are Nordic trade unions united? In the bigger picture, yes we are. We also agree that when we go deeper into things, we are quite different. For instance when it comes to what measures we want to work towards. But the bigger picture, when it comes to culture and the value of trust, is very similar. That is why we are keen for the trust not to be weakened, because the tripartite cooperation, the Nordic model, is built on trust. “We work with the UN sustainability goals, both nationally and globally. The Nordic Council of Ministers have established a working group, where we are keen to underline how important a role the partners play. When it comes to the parties’ and tripartite cooperation, we have something to teach the rest of the world. “We also agree about what we should focus on going forward: The platform economy, the drift towards a looser link to the labour market, social dumping and how to increase trade union membership in order to face these challenges. How can you for instance be organised if you do not have an employer? Well, such people also need safe working conditions. Right now we are discussing how we can be of help and offer support for them too." As leader for the Union of Education Norway, Ragnhild Lied accepted a negotiated result for wage and working conditions, which members dismissed in a referendum. She learned from that lesson. “I learned how important it is to have good and broad contact with the grassroots. Often what is brought to the table are issues which not always make as many happy as you might have imagined. “During the strike that followed the referendum, everyone stood together. The power of a referendum, where everyone in the union can express what they feel, is enormous. When you negotiate to find a solution the next time, the power is still enormous. Afterwards you became the leader for the confederation Unio, what do you think about that? “Of course when you have experienced success and failure, it gives you a ballast which is valuable for the position I now have as a negotiation partner for the member organisations. In that position you benefit from having different experiences. What is you hidden talent? "Baking. I think it is exciting to see what happens with the dough when you have worked it just so. I can really enjoy managing to make a perfect dough for buns, and I can enjoy shaping round, lovely buns. That is something I always enjoy,” she says and laughs heartily.